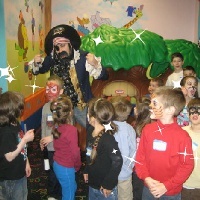 Delight your son or daughter at their next birthday with pirate theme parties in NY! New York pirate parties are great fun for boys and girls alike. They'll love getting dressed up in pirate clothes and giving you their most fearsome "arrr" at a New York pirate party. For even more underwater adventures on your birthday, use KidsParties.Party to hire mermaid entertainers in New York. Have your child's pirate party with professional entertainer Ken and his puppet friends. Children can come to the party in their most piratey garb to be ready for the treasure hunt and show Ken will lead. When you have Ken lead your party the kids will be delighted at a 45 minute long pirate puppet show featuring a pirate captain with a hook hand along with several other piratey characters. The children will follow the puppets and work together to figure out clues on a treasure map and find a hidden treasure! Ken has entertained for celebrities such as Kevin Kline, Madonna and Chris Rock and has over 20 years experience making parties extra special. He can also offer balloon twisting, face painting and more for your party! Pirate Face Painting, Balloon Swords and More! For a fun pirate-themed party hire Captain Daisy (also known as Daisy Doodle) to run your party! She will begin the party by giving each guest piratey face-painting including mustaches, eye patches, scars and more! They will then recite a pirate oath and start their pirate training under Captain Daisy. Kids will have a blast as Daisy runs them through pirate boot camp, gives them pirate balloon swords and a leads them in a pirate treasure hunt. Have your party guests come dressed in pirate outfits for an even more piratey party! Book your child's pirate party at Funtasia and all the kids are sure to have a blast! A fun party place with a jungle theme, Funtasia has tons of fun toys, games and climb-able structures to keep kids having fun. 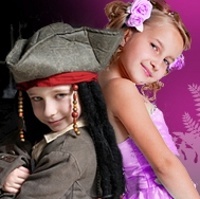 When you book a pirate or a pirate and princess party each child will receive his and her own themed costume to keep! Funtasia's pro party leaders will make sure everyone is having fun and will lead games, activities and a craft. Food, a themed cake, invitations, themed decorations and much more are provided at this fun pirate theme party in NY! Fun Pirate Birthday Party New York! Choose the Party Zone for your child's next birthday and make it a princess and pirate themed extravaganza! Kids will have a blast dressing up and getting pirate-themed face paint. Party Zone's party professionals will lead everyone in games and dancing and ensure each guest is having a great time. This party place can also customize a theme to your specifications so if you have ideas to make it even more pirate-like or to include elements of your child's favorite pirates, just let them know! Sail the Seas with this Pirate Entertainer! 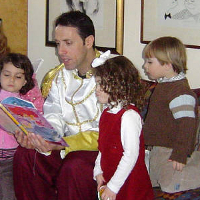 These zany entertainers can make your child's day special when you hire them to entertain. Throw a NY pirate theme party and have a pirate come visit your home or party venue to lead fun party games and activities. Balloon animals, a magic show, pirate face painting and a pirate treasure hunt will all be led by a fun yet fearsome pirate captain. Have each party guest dress up in their most pirate like outfit and get ready for a rollicking good time with these great party entertainers! Great Pirate Dress Up Party! You are sure to be impressed when you have Impress the Guest throw your next party. When you choose their Pirate themed party they'll take care of making sure each little pirate has a great time. 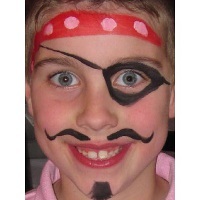 Kids will love having a pirate entertainer come to the party to transform them int real pirates! The entertainer will do pirate face paint, give the kids temporary tattoos, a pirate hat and jewelry all for their own! Twisted balloon swords will complete each pirate's outfit. 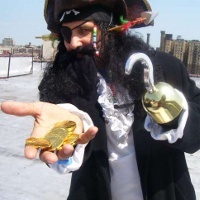 Many add-ons are available with this NY pirate parties package. You can have a craft where kids can decorate their own pirate hat or treasure chest, add more pirate garb to the giveaways such as vests and hooks, ask for an additional performer and much more! 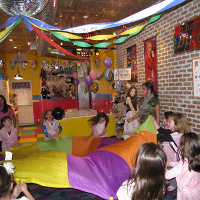 Party Palooza, located on Long Island, is a bright and clean party facility that offers many types of theme packages. If you'd like to throw your child a princess and pirate party in New York, this is the place for you! Not only will Party Palooza supply the costumes for each guest but they'll give each pirate a tattoo to complete their outfit! Once everyone is all dressed up and ready, the dance party begins! Kids will have a blast playing games, dancing and doing a special birthday craft of decorating their own treasure chests. Food and paper goods are provided, just bring the guests, the cake and your most piratey "arrrrr!" A Party Fit for a Captain! 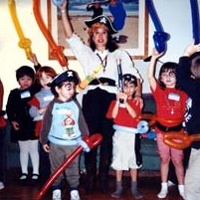 Thinking of throwing your child a pirate themed birthday party in New York? Staten Island's FunWorks party place is a great place to do it! Your child and guests will have a great time having pirate face paint, playing pirate games and dancing to pirate music. Two of FunWorks' party professionals will help lead the activities of the day. Kids will love going on a pirate scavenger hunt wearing their pirate headscarves and eyepatches or playing on the fun play equipment that fills the FunWorks play area. Food and cake are also supplied when you book your party at FunWorks. Kiddie Wonderland is a magical play place where kids can have loads of fun playing on the soft play climbing equipment, dancing on the dance floor and participating in games led by Kiddie Wonderland's party experts. When you book a pirate themed party a pirate captain can lead the children in a pirate scavenger hunt in search of booty! The children and their pirate leader will follow clues to find at last a hidden treasure full of pirate dress-ups. When everyone is dressed up as pirates, games and dances can begin! Upgrade with special extras to make the party even more fun! Everyone will have a great time when you hire Confetti Clowns to entertain at your child's birthday party. Themed parties are these entertainers' specialty, so have them do a pirate party for your little buccaneer and he or she will never forget it! When a costumed pirate comes to your home to run the party the kids will have a blast laughing at his wacky humor and funny antics. These parties are fully customizable so choose from a huge list of options such as face painting, magic shows, dancing, balloon twisting and much more. Confetti Clowns' pirate character can do it all. Have the kids dress in pirate outfits to bring the party theme together!